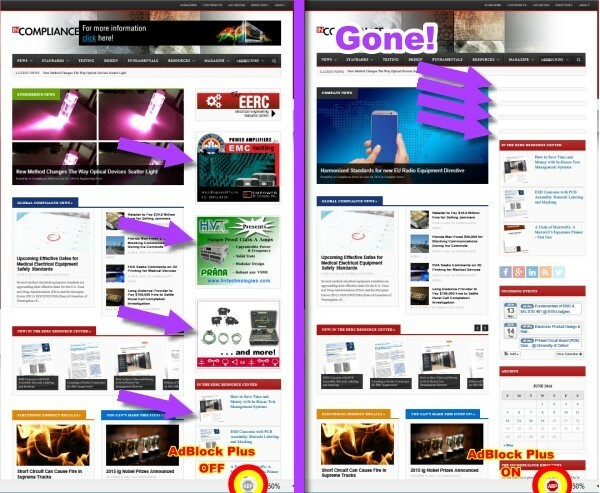 As someone who spends a lot of time surfing the Web in search of interesting electronics and technical news, I am painfully aware of the annoyances caused by intrusive, overwhelming advertisements. The most detestable are the full-screen ads that get in your face before ever seeing the webpage, and/or once on the page some cursed ad with video and audio plays automatically. It is no wonder that an exponentially increasing portion of Internet users are employing ad blocking software. Ad blockers, the most popular of which is AdBlock Plus (see chart at right of user penetration via PageFair's research), are essentially popup blockers on steroids. They install as add-ons for desktop browsers and as native apps for smartphones. 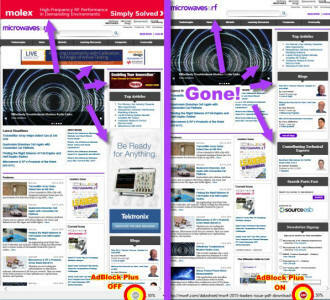 Ad blockers intercept anything and everything their designers decide might qualify as an advertisement - even if it might be legitimate content and not an ad at all. If you are an advertiser paying for proprietary representation on a website, you are advised to determine whether your ads can be blocked. What constitutes an 'acceptable' ad in their opinion? 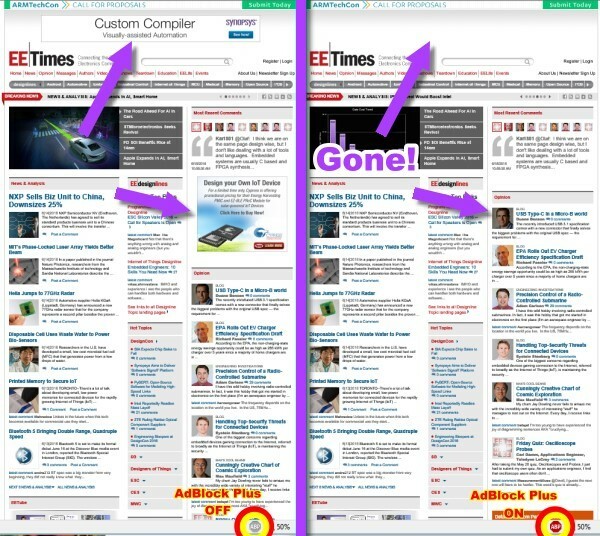 There are guidelines on AdBlock Plus that specify what size and placement should get through. 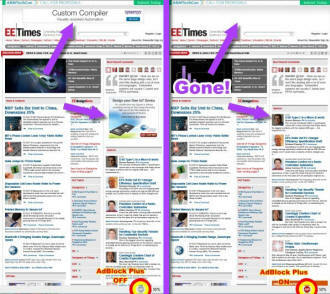 For example, "When placed above the primary content, the maximum height of an ad should be 200px. When placed on the side of the primary content, the maximum width of an ad should be 350px. When placed below the primary content, the maximum height of an ad should be 400px." Also, no ad may be placed within the primary page content. These restrictions alone disqualify the vast majority of ads. But wait, there's more. 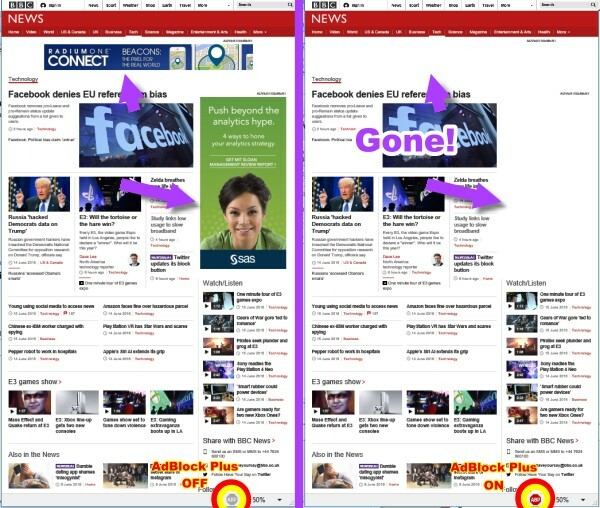 IFrames for serving ads are prohibited in all forms, all ads 'above the fold' may not occupy more than 15% of the total viewable area, and 'below the fold' ads may not occupy more than 25% of the viewable area. Blocking is not only reserved for graphics because even text-based ad will be blocked if it contains "excessive use of colors and/or other elements to grab attention." That doesn't leave much opportunity for ads. Among the long list of 'unacceptable' ad formats are: "Ads that visibly load new ads if the Primary Content does not change, Ads with excessive or non user-initiated hover effects, Animated ads, Autoplay-sound or video ads, Expanding ads, Generally oversized image ads, Interstitial page ads, Overlay ads, Overlay in-video ads, Pop-ups, Pop-unders, Pre-roll video ads, and Rich media ads (e.g. 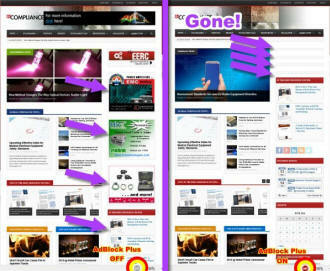 Flash ads, Shockwave ads, etc.)." "Hurray for AdBlock Plus!," you might be saying. Admittedly, I say that too for the truly obnoxious websites that mount an audiovisual jihad against you with noisy videos that play automatically, full-screen popovers, and opening screens that force you to make a choice of some sort. Up until a couple weeks ago, I operated under the mistaken assumption that ad blockers only attacked ads from 3rd-party publishers like Google and Bing; however, after installing AdBlock Plus on my computer and doing some testing, I was horrified to discover that the bugger was blocking not just all of my private ads that I display directly from the RF Cafe server, but also under certain conditions images that are a part of articles I have posted are also prevented from being displayed. It was a call to action that could not be ignored. If you do a search on ad blockers and how to defeat them, the consensus is that under most conditions there is no way around them. 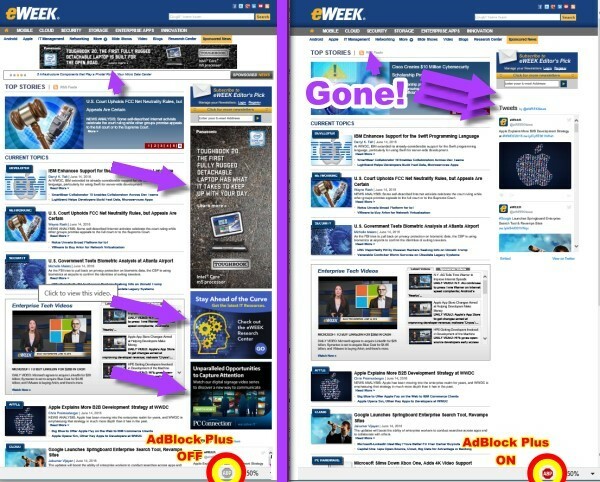 After some pretty extensive testing of scenarios, involving 3rd-party ads, privately served ads, and various carefully selected images, I arrived at some conclusions regarding what will and will not get past ad blockers. As usual, when I compare my empirically derived results with the majority of what is written by blogger and forum contributors, it is apparent that people are merely regurgitating what everyone else is saying without having any personal knowledge, and a lot is flat-out wrong. Website publishers, including yours truly, are very concerned with assuring advertisers that their messaging to our visitors is being delivered. RF Cafe relies heavily on RF component companies underwriting the costs of production, and therefore has to provide a certain level of return on investment to clients. If their ads are being blocked, no potential customers will visit their websites in search of products or services. There are two basic schools of thought on how to handle Web surfers who use ad blockers. The first is to include code in each HTML page that detects whether an ad blocker is at work, and if so present a message to the viewer requesting either that he/she/it add the website to the ad blocker's white list, or pay some nominal subscription fee. The former is only slightly likely to happen and the latter almost never happens. The user looks for the information somewhere else. People who would never consider giving away anything of their own for free expect to pay nothing for the benefit of someone else's efforts. That's just that way it is. After making some fairly major changes to the way RF Cafe serves ads, I have arrived at a system that permits my privately served banner ads to be displayed reliably despite AdBlock Plus' attempts to block them. I have even managed to get some 3rd-party ads to display - a feat not claimed by any of the posters whose comments I read while researching the issue. 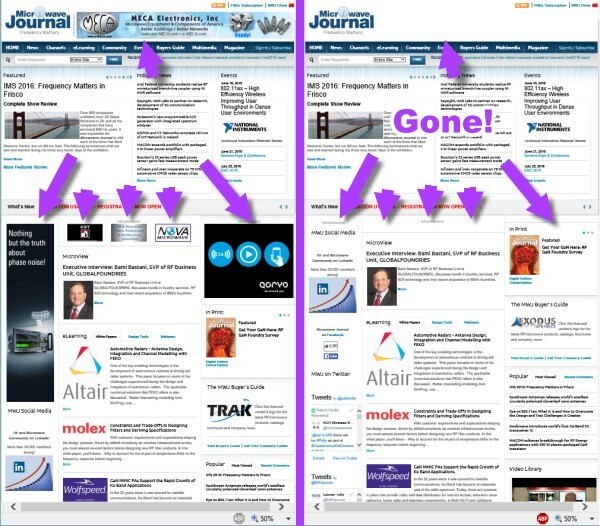 Part of my effort included testing most of the websites I visit frequently including technical news sites and trade magazine sites - a lot of which have ads from some of the same companies that advertise on RF Cafe. I discovered that what appeared to be private ads on those sites (i.e., not 3rd-party), were being blocked when AdBlock Plus was turned on. That goes for both desktop and smartphone testing. At least until the other websites fix their problems, I can claim that RF Cafe is currently the only engineering website I am aware of whose private advertisers' material is not blocked. There are some instances where what appears to be private ads manage to get through, but I believe based on testing that it is because of pure luck and not because of any intentional implementation on their part to thwart the blockers. What is my secret, you might ask? I'm not going to divulge my findings or my methods mainly because if I do, there will be an endless barrage of e-mails informing me of how wrong I am and that my methods don't work for them. 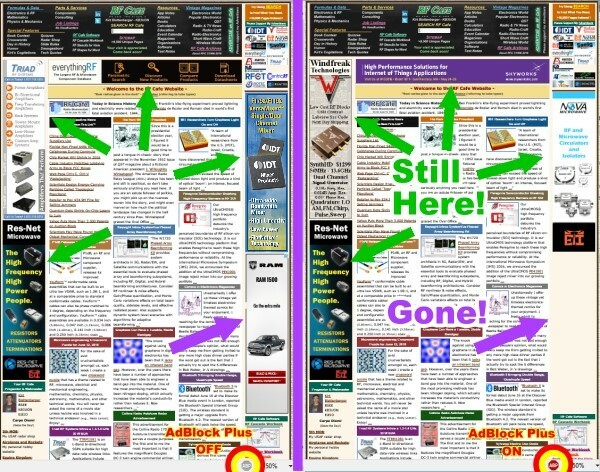 All I will say is if you run an ad blocker, take a look at a few RF Cafe pages both with and without the ad blocker enabled. You will see that my industry standard banner ads are consistently displayed in either case. This result has been confirmed in Internet Explorer, Edge, Chrome, Firefox, and Opera. As baseball Hall of Famer Dizzy Dean is often quoted as saying, "It ain't bragging if you can back it up." If you run an ad blocker, please do me a favor and add rfcafe.com to the website whitelist. Doing so will help keep RF Cafe on the air since otherwise the 3rd-part type ads will usually be blocked. 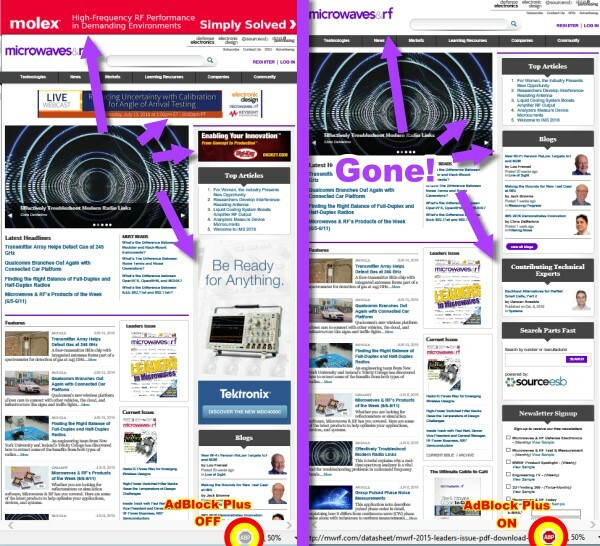 To the right are multiple examples of what some websites look like without and with AdBlock Plus running. 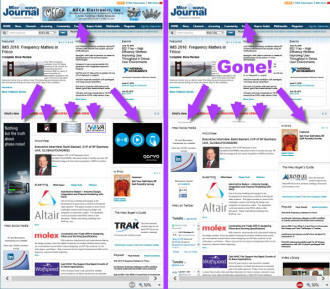 Note the empty spaces where ads used to be.